What is the Georgia Tech Capstone Design Expo? 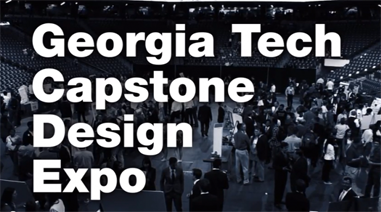 Check out this video from the Spring 2015 Capstone Design Expo, showcasing the innovation of Georgia Tech students. The Georgia Tech HyTech Racing team competed in the Formula Hybrid Electric competition this year on April 27-30 at the New Hampshire Motor Speedway in Loudon, NH. 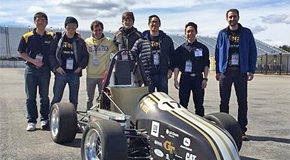 This was the first time Georgia Tech competed in the competition with a fully-functional, drivable electric car. Six students attended the competition – Michael Simon (team president), Nathan Cheek, Newton Chan, Jeff Ding, Mike Yan, and Victor Padron. Although the team is composed of students from many disciplines, all students at the competition were undergraduates or graduate students of the Woodruff School. Researchers have made significant strides in new energy generation technologies. Yet, before renewable sources can make a significant contribution to our energy supply, similar strides will be needed in energy storage, making it the new holy grail. “When it comes to renewable energy sources, there can be a mismatch between when power is available and when it’s needed,” said Tim Lieuwen, director of Georgia Tech’s Strategic Energy Institute (SEI) and professor at the George W. Woodruff School of Mechanical Engineering. 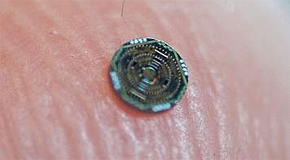 At Georgia Tech, more than 20 research teams focus on MEMS-related research and development. MEMS, or microelectromechanical systems, are devices that operate on a very small size scale, on the order of microns (millionths of a meter). Supporting them is the Institute for Electronics and Nanotechnology (IEN), one of Georgia Tech’s nine Interdisciplinary Research Institutes. 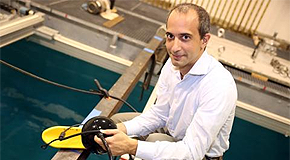 Karim Sabra of the Georgia Institute of Technology has been awarded the Medwin Prize in Acoustical Oceanography by the Acoustical Society of America (ASA) for contributions to the development of ambient noise inversion techniques. The award was presented at the 169th meeting of the ASA on May 20, 2015 in Pittsburgh, Pennsylvania. 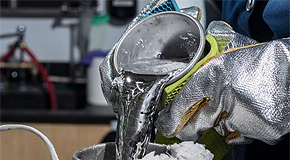 The U.S. Department of Energy recently awarded 32 fellowships to graduate students in engineering and science programs related to nuclear energy. 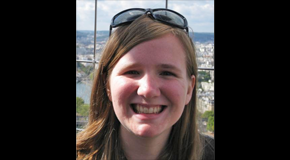 Katherine Scott, an ME PhD student advised by Professor Laurence Jacobs, was the sole student from Georgia Tech to be awarded a Nuclear Energy University Program (NEUP) Fellowship. 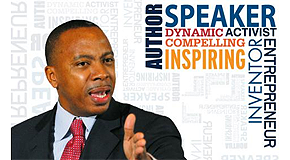 Dr. Calvin Mackie, award-winning engineer, internationally-renowned motivational STEM speaker, successful entrepreneur, and bestselling author was honored with The College Board’s 2015 Dr. Asa G. Hilliard Model of Excellence Award. Mackie received his B.S., M.S., and Ph.D. degrees in mechanical engineering from Georgia Tech. It is hard to believe that yet another academic year has passed and another tremendously successful one at that. The Woodruff School continues to have the largest undergraduate program on campus and our students are benefiting from the flexible curriculum as well as the expanded design-build-create-and-innovate elements of our program.